Sage is startled when he notices an onlooker. 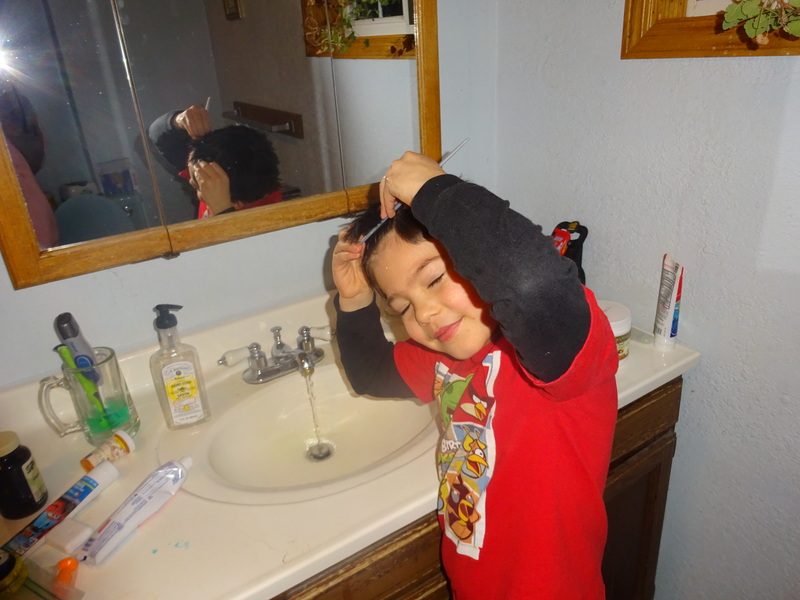 I peeked through the bathroom doorway, observing my son Sage meticulously applying “product” to his hair and lovingly combing each gel-coated strand. I knew better than to speak; any interruption of his intense preening would result in a shrill and eloquent reprimand. I had trouble biting my tongue, though, when I had a sudden revelation: This wasn’t just a six-year-old with a slightly disconcerting hair obsession. This was a Family Legacy. 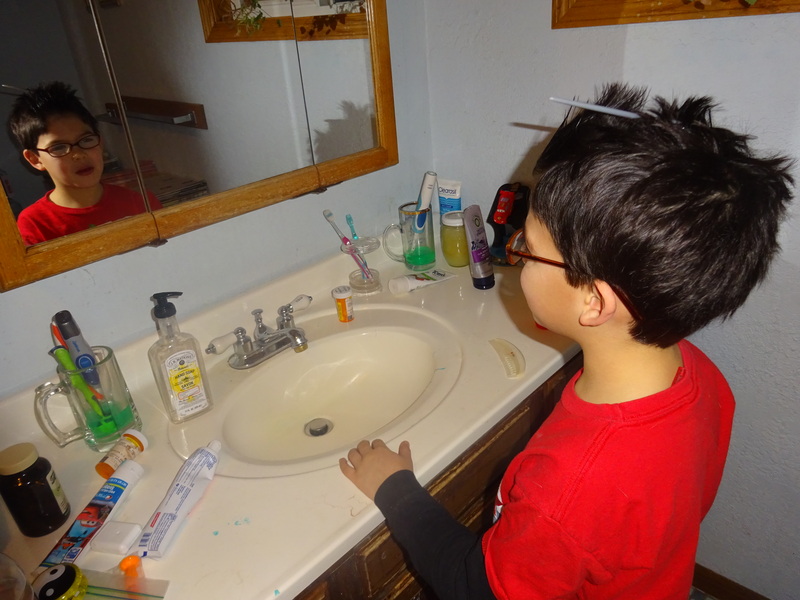 Sage carefully inspects his work in the mirror. My son was a miniature reincarnation of my grandma Naomi’s older brother Paul. Not only did Paul share a name with Sage’s father; he also shared Sage’s overwhelming concern with hair. I’d never met Paul myself, but I’d heard stories about him. 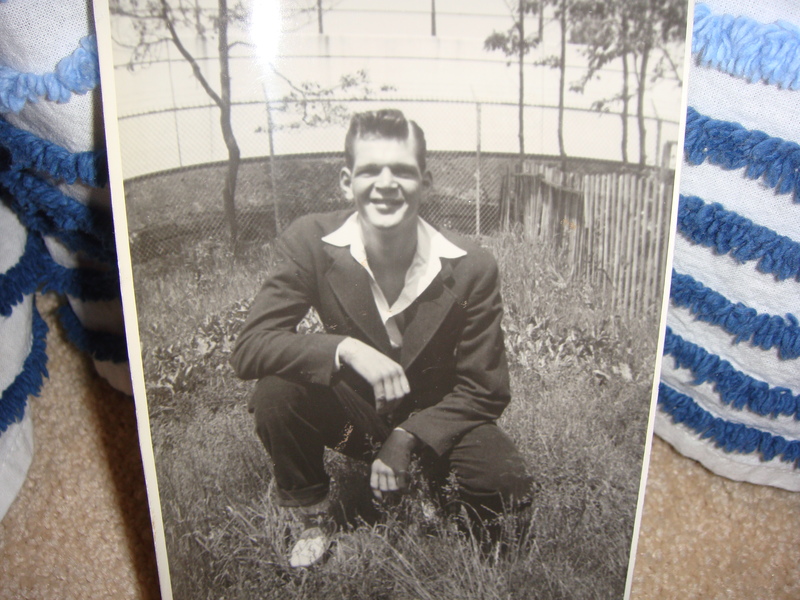 My grandma’s brother Paul as an adult; note the still-immaculate hair. During the height of the Depression, my grandma had explained, one of the few entertainments available to teenagers like Paul was roller skating. Despite the dustiness and overcrowding at the rink, Paul loved roller skating and would go there almost every night. He was a proficient skater and enjoyed showing off his moves. Unfortunately for Naomi, he had to look good doing it, and she became the unwilling conscript in his preparations. 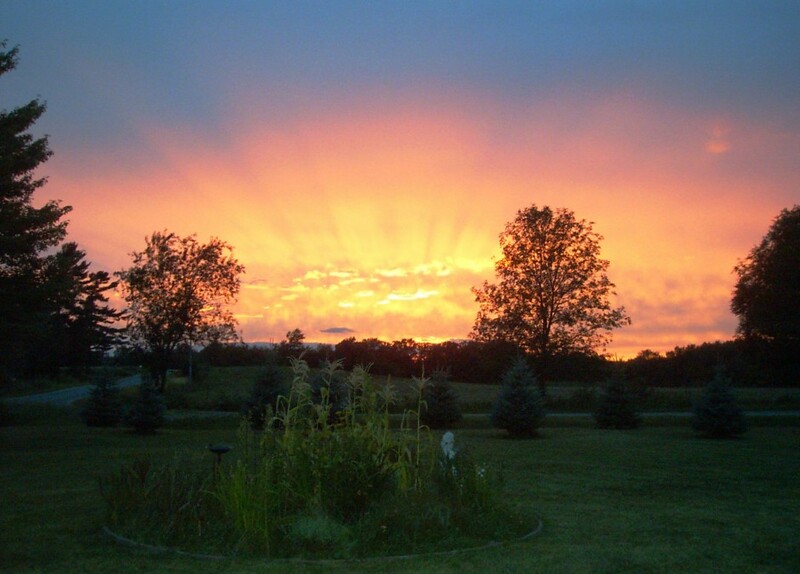 Like many families in their town, the Kimballs were living in dire poverty. Virtually all of the furniture in the living room had been sold or burned for heat. One of the few furnishings that had survived the purge, however, was a mirror hanging on the wall, a mirror that became the bane of Naomi’s existence. Since the house had no electricity, Paul would force his little sister to stand at his side holding a candle as he meticulously combed every strand into place. The only source of heat in the house was a woodstove in the kitchen, sadly far from the site of Paul’s primping, so Naomi would shiver sullenly as her brother carefully examined his head from all angles. Finally, after what seemed to her like hours, he would free her and go forth on his skating expedition, leaving her to try to restore feeling in her extremities. Sage clearly enjoys the primping process. 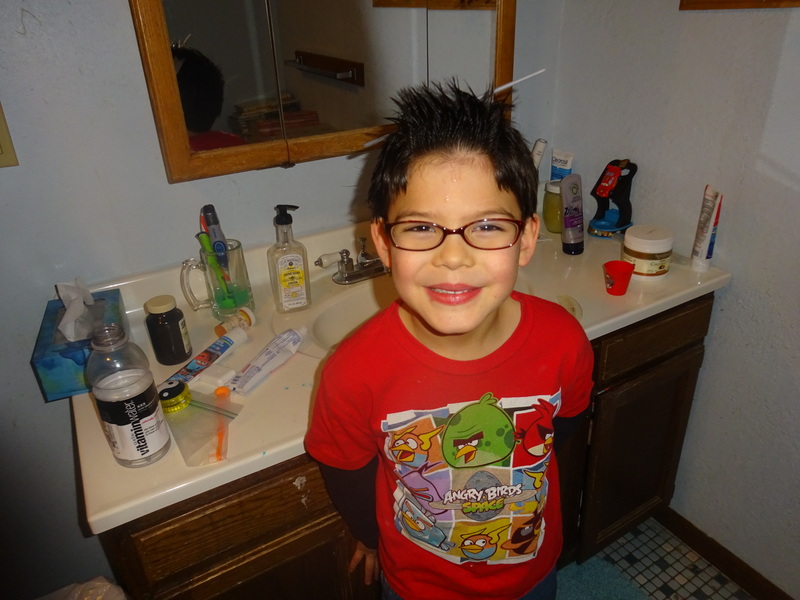 Unconcerned with history, Sage stuck a comb through his hair, deemed his look complete, and went to show his father. 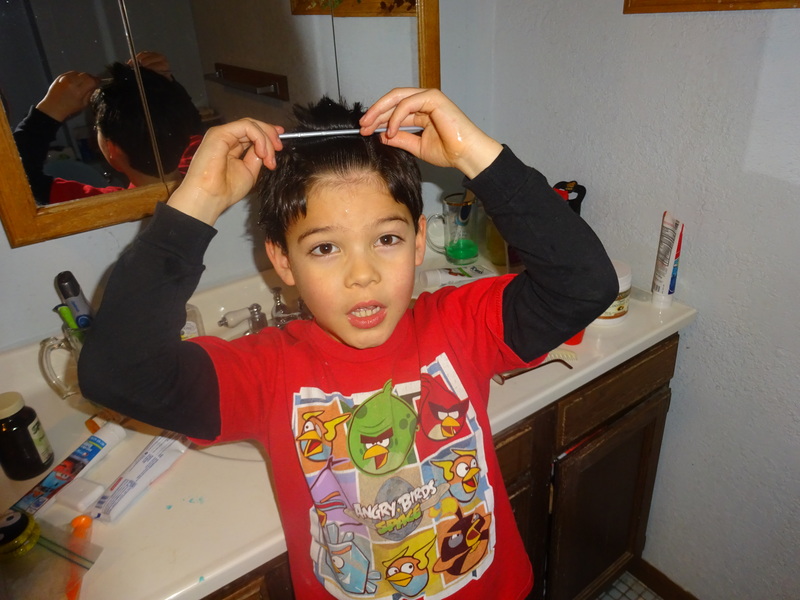 Sage displays his groundbreaking “Hair Impaled By Comb” look. Reblogged this on Naomi's Story. This is the stuff of memoir. The apple doesn’t fall far from the tree . . . And other such platitudes. I’m glad you liked it; thanks as always for your kind words! I didn’t recognize him in the first picture. He looks much older. The hair obsession is pretty weird, I must admit. Didn’t get it from you, did he?